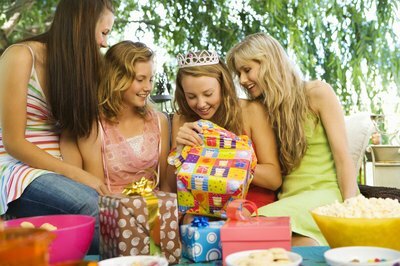 Plan a special birthday celebration for your 15-year-old daughter that she will never forget. Think ahead about the party’s location, theme, menu, decorations and games to create a memorable event for your daughter and her friends. Decide whether or not the party will be just the girls, co-ed and where it will take place. Consult your daughter about her ideas, and start planning. Select a theme for your teenage daughter’s party that matches her personality and interests. Choose a movie-themed party for a young aspiring actress or a cooking or baking party for a daughter who loves to be in the kitchen, for instance. 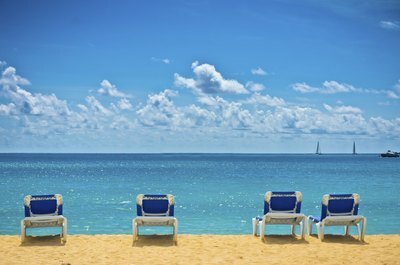 Create a fun beach party theme during the summer or a spa party to pamper your daughter and her friends. Make decisions about menu, food, decorations and games based upon the theme you choose. Base the menu for your daughter’s party around the party’s theme, such as serving gourmet popcorn at a movie-themed party. Develop a menu that teens will love by providing a variety of appetizer-like options from which they can select. Make teen-friendly foods like nachos, miniature pizzas and potato skins for savory snacks. Provide dessert options like ice cream sundaes, miniature cheesecakes and chocolate fondue with a variety of dipping options, like cut up fruit or vanilla wafers. Select theme-related decorations for your 15-year-old’s birthday party. Purchase balloons, streamers, tablecloths, plates and napkins in her favorite colors or colors that match the theme. Hang white twinkling lights in the party area for a dance-themed party or a Hollywood-themed party. Buy inexpensive centerpieces that go with the theme and can also be used at the party, such as a sand pail full of colorful beach towels at a pool party. Entertain your daughter and her party guests by planning a few teen-appropriate games for the event. Adapt games to the party’s theme, of course; for instance, use words like “hula” and “lei” for charades at a luau-themed party. Try karaoke, using pop music options that your daughter and her friends will likely be familiar with. Include at least one game that involves prizes that the guests can take home, such as the dice game. Play the dice game by having several wrapped gifts in the center of the room. Each guest rolls the dice; when a guest gets doubles, he or she can take a gift. Versions of this game can include opening the gifts and stealing the gifts, as well.